A tiny version of this rooster has been hidden somewhere in the pages of the current print issue. If you find it, fill out this form with its location, your name and address and you will be entered into a random drawing. The first correct entry drawn will receive a piece of highly rated piece of kitchen equipment, and each of the next five will receive a free one-year subscription to Cook's Country magazine. Entries for the current issue are due by the last business day of the month. By submitting material for publication, you grant Cook's Country magazine unrestricted use of the material, including your name, hometown and state. We reserve the right to modify, reproduce, and distribute the material in any medium and in any manner. 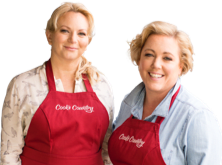 If your idea is chosen for publication, an editor from Cook's Country magazine will contact you via phone, email or mail. Your email address is safe. We will not sell, rent or disclose your email address to third parties. Patrick Frieslander of Nokesville, Virginia, found the rooster on page 7 and won our favorite loaf pan. Francis Riley of Seattle, Washington found the rooster on page 13 and won our favorite nonstick skillet. Elizabeth Bird of Scott Depot, West Virginia and Joan Montgomery of Deland, Florida found the rooster on page 11 and won our best buy cooler. Rooster ran away but we found them twice in our August/September 2018 issue. Libby Zimbelman of Mt. Laurel, New Jersey, found the rooster on page 21 and won our favorite multicooker. Pam Bonham of Squaw Valley, California, found the rooster on page 18 and won our favorite kitchen tongs. Darliene Farrar of Beaverton, Oregon, found the rooster on page 13 and won our favorite inexpensive blender. Patricia Pou of Black Mountain, North Carolina, found the rooster on page 14 and won our winning pie plate. Aphton Check of Prairie du Chein, Wisconsin, found the rooster on page 18 and won our favorite paper towels. Corey Pollack of Forest Grove, Oregon, found the rooster on page 11 and won our favorite paring knife. Dan Phillips of Anchorage, Alaska, found the rooster on page 8 and won our favorite muffin tin. Joy Nakfoor of Lansing, Michigan, found the rooster on page 6 and won our favorite immersion blender. Margaret Barre of Seneca, South Carolina, found the rooster on page 6 and won our favorite inexpensive Dutch oven. Jennifer Kostick of Sykesville, Maryland, found the rooster on page 17 and won our favorite nonstick skillet. Jake Davis of Scappoose, Oregon, found the rooster page 6 and won our favorite dry measuring cups. Stephanie Sharp of Omaha, Nebraska, found the rooster on page 14 and won our favorite kitchen timer. Constance Conomikes of Williamsburg, Va., found the rooster on page 12 and won our favorite inexpensive digital thermometer. Jean Munch of Cincinnati, OH, found the rooster on page 12 and won our favorite springform pan. Susan Beasley of Cedar Creek, Texas, found the rooster on page 24 and won our favorite small food processor. Lowell Heine of Minneapolis, Minn., found the rooster on page 24 and won our favorite slicing knife. Richard Eisenbery of Glendale, Calif., found the rooster on page 12 and won our top-rated water bottle. Kate Kettles of Dallas, Texas, found the rooster on page 10 and won a set of our favorite potholders. Ronald Hertzog of Sinking Spring, Pennsylvania, found the rooster on page 12 and won our winning can opener. Susan Rhood of Purcellville, Virginia, found the rooster on page 18 and won our winning citrus juicer. Lisa Samec of Forest Lake, Minnesota, found the rooster page 4 and won our winning handheld mixer. Marlene Rice of Cheshire, Massachusetts, found the rooster on page 14 and won our favorite slow cooker. Sara Morandini of Aurora, Colorado, found the rooster on page 6 and won our winning vacuum sealer. Colleen Palmer of Okemos, Michigan, found the rooster on page 4 and won a set of our winning dish towels. Betty Toth of Downers Grove, Illinois, found the rooster on page 18 and won our winning dish towels. Robert Barello of Macomb, Michigan, found the rooster on page 21 and won our top-rated roasting pan. Catherine Pease-Schafer of Millville, New Jersey, found the rooster on page 7 and won our top-rated roasting pan. Lily Dioletto of Newark, California, found the rooster on page 17 and won a set of our winning cake pans. Laurel Peakman of Fairhope, Ala., found the rooster on page 6 and won our winning small slow cooker. Nanette Campbell of Port Charlotte, Fla., found the rooster on page 9 and won our Best Buy two-slice toaster. Marge Thomssen of Lincoln, Neb., found the rooster on page 13 and won our top-rated salad spinner. Audrey Wood of Manhattan, Kansas, found the rooster on page 4 and won our favorite cookie sheet. Carol Trosper of Silver Spring, Md., found the rooster on page 7 and won our favorite moderately priced 12-inch skillet. Lorili Johnson of Newport, WA., found the rooster in the turkey photo on page 4. She won our favorite grill pan. Lisa Herren of Franklin VA., found the rooster in the Smoky Pulled Pork step by step photo on page 25. She won our favorite rolling pin. Claire Ketch of Woodbridge, VA., found the rooster in the Beef and Bean Taquitos with Avocado Sauce photo on page 10. She won our favorite innovative cutting board. Bill Bauer of Savage, Minn., found the rooster in the Pork Chops with Tomato Gravy photo on page 21. He won our favorite innovative cutting board. Bill Bauer of Savage, Minn., found the rooster in the Chinese Chicken Salad photo on page 20. He won our favorite cutting board. Gloria Ripley of Spearfish, S.D., found the rooster in the Crown Roast of Porkphoto on page 12. She won our favorite oven mitt. Monica Leightenberg of Covington, La., found the rooster in the Smoky Indoor Ribs photo on page 17. She won our favorite travel mug. Cecilia Trent of La Salle, Ill., found the rooster in the "Better Baking" Shortcut photo on page 3. She won our favorite portable charcoal grill. Peggy Soltis of South Charleston, S.C., found the rooster in the Chicken Chimichangas photo. She won our favorite portable charcoal grill. Rowena Sjovall of Lithia, Fla., spotted it in the Smothered Pork Chops photo. She won a pair of our favorite kitchen shears. Elaine Balufuss of Fargo, N.D., spotted it in the Pastitsio photo. She won our favorite muffin tin, the Wilton Avanti Everglide Metal Non-Stick 12-Cup Muffin Pan. Anna Miner of Skamania, Wash., spotted it in the Homemade Stufing Mix photo. She won our favorite toaster, the Kenmore 4-Slice Toaster. Claudia Luszcz of Charlestown, R.I., spotted it in the Wild Rice Dressing photo on page 11. She won an HIC Porcelain Lasagna Baking Dish. Chad Strunk of Plymouth, Minn., spotted it in the Grilled Potato Hobo Packs photo on page 18. He won a Crock-Pot Touchscreen Slow Cooker. Rinna Lipsky of Philadelphia, PA, spotted it in the Peach Brown Betty photo on page 22. She won a Kalorik Sunny Morning Stick Mixer. Diane Tyler of San Antonio, Texas, spotted it in the Chicken Cordon Bleu photo on page 14. She won a Kalorik Sunny Morning Stick Mixer. Ron Fenstemacher of Kaneohe, Hawaii, spotted it in the Make-Ahead Shepherd's Pie photo on page 5. He won a Cuisinart Power Advantage 7-Speed Hand Mixer. Todd Ketch of Woodbridge, Va., spotted it in the Cider-Braised Chicken photo on page 23. He won a Cuisinart Power Advantage 7-Speed Hand Mixer. Pat Bell of Corona, Calif., spotted it in the Kitchen Creations photo on page 30 and won a Michael Graves Design Hamilton Beach 4-Slice toaster. Marilee Cronin of Madison, Wiscounsin, spotted it in the Sausage and Cornbread Dressing photo on page 13. She won a Foodsaver V2240 Vacuum Sealer Kit. Linda Tekieniewski of Munnsville, N.Y., spotted it in the Easy Chicken Tacos photo on page 15. She won a Foodsaver V2240 vacuum sealer. Jill Richlovsky of Cleveland, Ohio, spotted it in the Minty Sugar Snap Peas photo on page 19. She won an Anolon Advanced Double Burner Griddle. Clare Moss of Locust Fork, Alabama, spotted it in the Sour Broccoli Rabe photo on page 22. She won a Michael Graves Design Hamilton Beach 4-Slice Toaster. Matthew Davis of Stevens Point, Wis., spotted it in the test kitchen photo on page 13. He won a Calphalon spatula. Carolyn Hunter of Dunedin, Fla., spotted it in the Boneless Buffalo Chicken photo on page 25. She won a Michael Graves Design Hamilton Beach 4-Slice Toaster. Diane Tyler of Kirby, Texas, spotted it in the Beef and Vegetable Kebabs photo on page 10. She won an Analon Advanced Double Burner Griddle. 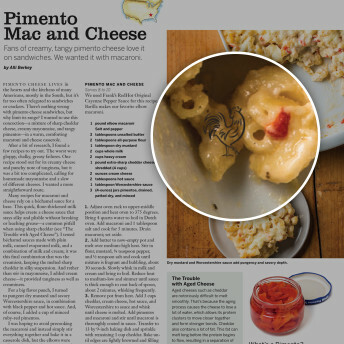 Patrice Addertion of Raleigh, N.C., spotted it in the Clams Casino Sauce photo photo on page 5. She won a Anolon Advanced Double Burner Griddle. Pat Bell of Corona, Calif., spotted it in the Creamed Spinach with Parmesan and Prosciutto photo photo on page 23. She won a WearEver Premium Hard Anodized 12-inch Nonstick Skillet. Cheryl Bardaville of St. Louis, Mo., spotted it in the Penne with Sausage and Broccoli photo photo on page 21. She won a Unicorn Magnum Plus Peppermill. Lorili Johnson of Newport, Wash., , spotted it in the Ham and Bean Soup photo on page 10. She won a KitchenAid Classic Plus Stand Mixer. Beth Redman of Wellsburg, N.Y., spotted it in the animal cracker photo on page 27. She won an All-Clad Stainless Steel Slow Cooker. Nick Hiller of Columbia, S.C., spotted it in the Blueberry Streusel Muffin photo on page 22. He won an All-Clad Stainless Steel 4-Quart Sauce Pan. Mary T. Livermore of Spencerport, N.Y., spotted it in the Lemon Asparagus Casserole photo on page 21. She won a Black &amp; Decker SmartBrew 12-Cup Coffeemaker. Emily Smith of South Bend, Ind., spotted it in the Crunch Potato Wedges photo on page 14. She won an All-Clad Stainless 12-Quart Stock Pot. Norine Enz of Lake Odessa, Mich., spotted it in the Monte Cristo photo on page 11. She won a Calphalon Contemporary Stainless Steel Roasting Pan. Geraldine M. Hughes of Council Bluffs, Iowa, spotted it in the bowl of stuffing on page 24. She won a set of Forschner knives and a one-year subscription to Cook's Country. Carol Suzuki of Dublin, Ohio, spotted it in the stuffed pepper photo on page 24. She won a Thermapen thermometer. Johnny Sue Frazee of Frankton, Ind., spotted it in the Grilled Chicken Pasta Salad photo on page 21. He won a Calphalon spatula and a one-year subscription to Cook's Country. Pam Bonner of Marinette., Wis., spotted it in the potato pancake photo on page 20. She won a Cuisinart skiller. Ann Mantooth of Knoxville, Tenn., spotted it in the pear salad photo on page 21. She won a Farberware toaster. Lenda Burns of Huntington, W.V., spotted it in the photo of the Cream Sauce with Sausage and Peas on page 5. She won a Krupps Universal Grill and Panini Maker. Shirley Thomas of Sherwood, Ore., spotted it in the photo of the chimney starter on page 25. She won a Forschner's chef knife. Dean Everett of Lawrenceville, Ga., spotted it in the Shanghai Chicken Salad recipe card. He won a Braun PowerMax Blender. Christine Owen of Shorewood, Ill., spotted it in the Cracker Jack cupcake pictured on page 27. She won a Rival Cool Touch Deep Fryer. Sue Zuega of Bridgewater, New Jersey, spotted it in the pot roast picture on page 10. She won a Farberware slow cooker.